﻿ Swings for Sensory Integration , Autism therapy swings, Special Needs Swings and Vestibular Motion. 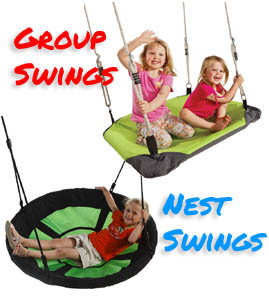 Vestibular Swings and Autism Swings - Residential and Commercial Swings and Swing Attachments. Allow your children to have fun in there own backyard with providing them a swing set and swings. Did you know that swings are not just for fun! The benefits that swings can provide are more than what we think. This means your kids are developing skills while swinging on a swing set. Children playing on swings, have been found to improve balance and coordination by strengthening the Vestibular system. So, swinging on a swingset helps develop both balance and coordination in children - Swinging on swings is not just for play and fun. We have a huge range of swings to choose from, therapy swings, group swings, traditional park style swing seats that are commercial grade quality, adult swings and baby swing seats. What swing will you choose? 2Pcs (118) cm Tree Swing Hanging Straps, Outdoor Strap for swings & Hammocks 2Pcs Qualit..
Moulded Strap Swing 'Blue' with Adjustable ropes. Ribbed Strap swing Blue Flexible top qua..
Moulded Strap Swing 'Red' with Adjustable ropes Ribbed Strap swing Red Flexible top quality m..
Moulded Strap Swing 'Yellow' with Adjustable ropes Ribbed Strap swing seat Flexible top qualit..
Sensory Nest Swing 'Winkoh' 1m Diam. Children's outdoor Nest sensory swing - 150kg weigh.. Rotating Swivel Hook Gives full rotations while swinging Very smooth ro..
Lycra Swing - Sensory Swing - Autism Swing - Occupational Therapy Swings This Lycra sen..
Nest Swing Oval Blue - Children's special needs nest swing - Outdoor Nest swing 150kg weight l..
Nest Swing Oval 'Green' - Children's outdoor Nest swing - 150kg weight limit - adjustable ropes.This..
Sensory Pod Swing Australia - Outdoor Pod Swing Blue- Occupational therapy swing - kids H..
Sensory Pod Swing Green - The Sensory kids pod chair works as a sensory swing, designed fo.. Pink Pod Swing - Occupational therapy swing - kids Hammock The Pink sensory pod..
Red Pod Swing - Occupational therapy swing - kids Hammock The Red pod swing is ..
Sensory Nest Swing Round - Great outdoor web swing seat for backyard funThese Nest Swings are the be..
1Pcs (118) cm Tree Swing Hanging Straps, Outdoor Strap for swings & Hammocks 1Pcs Qualit.. Medium Rubber Steel Insert Swing with Plastic coated ChainMedium Safety Swing Seat This sea..
'Sampa' - Nest Swing - Web Swing - Great large swing, like a boat swing - weight limit 150kg - UV pr..
Swibee - Nest Swing - Web Swing - Great web swing design - weight limit 150kg - UV protectedThe resi..
Sensory Pod Swing Blue - Therapy Swing - Great sensory swing for children with autism who crave ..
Senior Safety Swing Seat Commercial With Plastic Coated ChainsAdult Senior swing seat for adults wit..
Nest Swing 'Climbing' with Rope Ladder - Rope ladder nest swing The Awesome ..
Nest Swing Climbing swing Round with optional Rotating clip includedThese Nest Swings are the ..
Slashproof Rubber Swing with Chain.. Outdoor Platform Swing Cleanable Fabric - also known as the nest swing - or web swing seat - UV prot..
Slashproof Rubber Swing with Ropes ..
Nest Swing 'Squaro' – Special Needs nest Swing – Sensory Play Equipment - .. Medium Rubber Steel Insert Swing with Rope..
Nest Swing - Commercial Web Swing seat - Group swing for all abilitiesInclusive Play Equipment -The ..
Galvanised Swivel Jaw Ideal use : By joining all ropes on nest swings to be able to swivel ..
Duo Swing Hook – A Great swing hook designed for nest swings that have four suspension po.. Foot Swing - Swing attachment The Foot Swing helps Improve balance and coordinati..
Inclusive Play Equipment - Infant High Back Disabled Swing Seat (Seat only)High back infant disabled.. Wooden Trapeze with Plastic Rings .. Infant Swing Rubber Full Bucket with ChainsThe infant swing seat is a really safe baby swing seat by.. Infant Swing Rubber Half Bucket with Ropes.. Growing Swing SeatInfent baby seat with a great high back support. Made out of three detachable plas.. Buoy Ball Swing - Vestibular StimulationGreat for providing proprioceptive and core stre..
Coloured Ball Rope SwingThis colored rope ball climb is great for climbing skills. Bright and easy a..